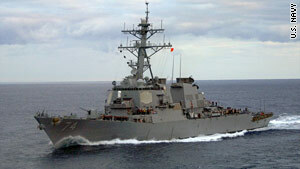 (CNN) -- A U.S. destroyer is shadowing a ship off the coast of Somalia after it was taken over by 50 pirates, authorities said. "We cannot be sure what the pirates' plan was if they had not been interrupted," said Rear Adm. Beom Rim Lee, commander of the Combined Maritime Forces task force. "The vessel may have been on its way to either assist other pirates in distress, or look for another merchant vessel to attack," he said. The M/V Iceberg was last been seen off the coast of the Somali town of Garacaad, a known pirate haven, but its exact location was unknown until USS McFaul positively identified it. "Further investigation showed the name of the ship had been crudely painted over" in an effort to disguise it, which caused confusion in identifying it, the Combined Maritime Forces statement said. "Given the report of heavily armed pirates on board, it was more prudent to monitor the ship's movement, rather than attempt a rescue," he said.